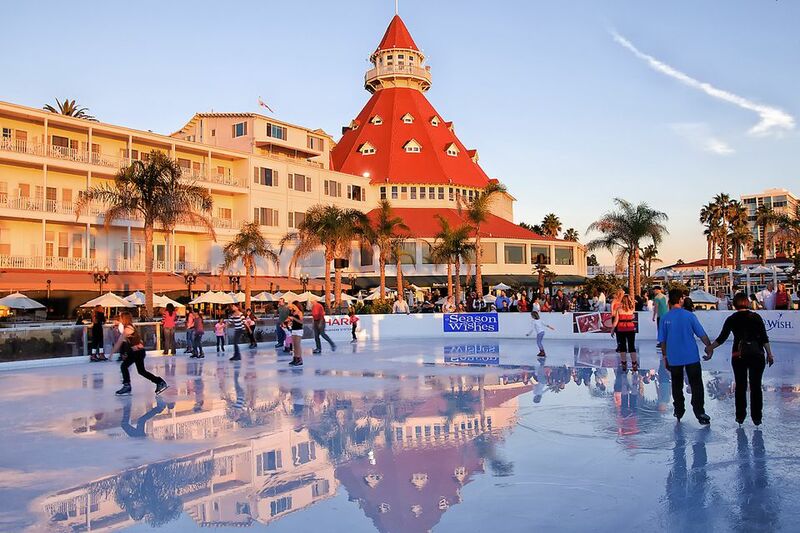 If you visit San Diego in December, you won't find ice or snow unless someone made them artificially. Santa Claus is more likely to be wearing board shorts and a Hawaiian shirt than a fur-trimmed red velvet outfit. And you might see people surfing on Christmas Day. You won't have a white Christmas on your San Diego trip unless you head for the mountains, but December is in the rainy season, and all of the monthly rainfall often comes all on the same day, especially during winter storms. If precipitation happens, try these things to do on a rainy day in San Diego. If you want to compare these weather conditions to what San Diego is like the rest of the year, you can find that all in one place in the guide to San Diego's weather and climate. And you can get more info to help you decide whether to visit in December by checking the pros and cons of going to San Diego in the winter. Pack an umbrella or rain jacket with hood for rainy days and a warm jacket if no rain is predicted. You won't need a heavy winter coat. Long-sleeved shirts and sweaters in layers work best. A scarf is a good idea, too. San Diego residents are causal dressers, wearing shorts, T-shirts and yoga pants any time they can. For a meal in a fancy restaurant, men can get by with nice jeans and a collared shirt. For women, casual dresses are perfect. Stuff a pair of tights in your day bag to layer beneath it in case it gets chilly, and bring some jewelry to dress it up. If you want to enjoy the nightlife in the Gaslamp, however, bring those party dresses, fancy shoes, and whatever else you might wear for a night out on the town. Some people say to pack your flip-flops for San Diego. That's a good idea if you want to walk on a sandy beach, but if you follow that advice for your only footwear in December, you could end up with cold or wet toes. If you want to spot some of the migrating whales from the land, don't forget your binoculars. And if you plan to go across the border to visit Tijuana, you'll need a passport. Use this guide to crossing the border to get all the details. Most of San Diego's December events are centered around the holidays. You can use the guide to Christmas in San Diego to explore the best Christmas celebrations, parades, pageants, concerts and holiday activities in San Diego. If you're a big fan of parades, don't miss the Holiday Bowl Parade, which includes marching bands, floats, drill teams, and more enormous balloons than any other parade (including the one in New York City). San Diego whale watching season runs from December through March. Use the San Diego whale watching guide to learn more about California whale-watching and San Diego excursions. Hotel occupancy is at its lowest level of the year in December, which makes it a good time to get a great hotel rate. Some attractions may be closed on Christmas Day, although the major theme parks including Sea World, Legoland, and the San Diego Zoo are open. Check with places you want to go to find out their hours during the holidays. Besides these seasonal tips, don't miss these tips that are good for San Diego visitors year round.